Tuesday June 5th 1894 I ironed this morning worked our butter and got the other work done by noon. I went to town in the afternoon for some things we needed I was over home awhile. Edith rode back with me as they were invited to Ella Maines wedding this evening I got home at six oclock and began my evening work. 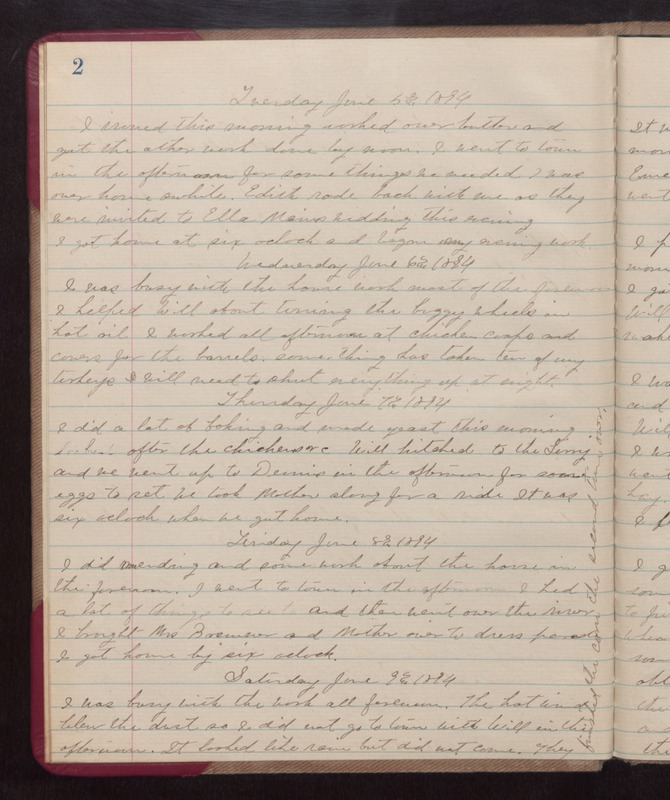 Wednesday June 6th 1894 I was busy with the house work most of the forenoon I helped Will about turning the buggy wheels in hot oil I worked all afternoon at chicken coops and covers for the barrels. something has taken ten of my turkeys I will need to shut everything up at night. Thursday June 7th 1894 I did a lot of baking and made yeast this morning Looked after the chickens &c Will hitched to the ferry and we went up to Dennis in the afternoon for some eggs to set We took Mother along for a ride It was six oclock when we got home Friday June 8th 1894 I did mending and some work about the house in the forenoon. I went to town in the afternoon I had a lot of things to see to and then went over the river I brought Mrs Brewster and Mother over to dress parade I got home by six oclock Saturday June 9th 1894 I was busy with the work all forenoon. The hot wind blew the dust so I did not go to town with Will in the afternoon. It looked like rain but did not come. They finished the corn the second time over.